Murder on the Home Front is a new two part ITV drama set in London during the Blitz and is loosely based on the memoirs of Molly Lefebure, a secretary to Home Office Pathologist Keith Simpson. It documents the different crimes committed in London at the time by individuals who used the distractions and devastation of the war to conceal their actionsr. Murder on the Home Front features many familiar faces, including Patrick Kennedy (Boardwalk Empire, Parade’s End) and Tamzin Merchant (Jane Eyre, The Tudors) as well as James Fleet (Four Weddings and a Funeral, The Vicar of Dibley) and Emerald Fennell (Any Human Heart, Anna Karenina). The Historic Dockyard in Chatham was used to re-create the London streets of World War II. Thanks to its authentic and historic exterior, the The Historic Dockyard in Chatham has often used as a location for productions such as Call the Midwife (2012-2013), Les Misérables (2012) and Sherlock Holmes (2009). 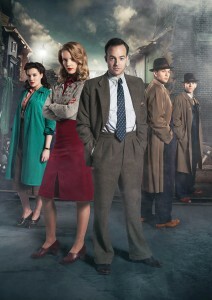 Don’t miss the first episode of Murder on the Home Front which airs on Thursday 9th May 2013 on ITV1 at 21:00. This entry was posted in Filmed in Kent and tagged Emerald Fennell, James Fleet, Murder on the Home Front film locations, Patrick Kennedy, Tamzin Merchant, The Historic Dockyard Chatham, TV Drama. Bookmark the permalink. ← British Independent Film Festival visits the Gulbenkian!